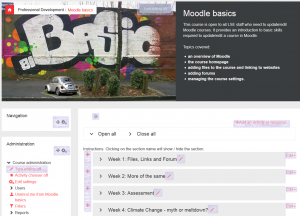 In order to add content or activities to Moodle, you need to Turn Editing On. If you cannot see the option to do this at the top right of the course image, you will need to request Teacher (Editor) access from your Departmental Administrator or LTI on lti.support@lse.ac.uk. Once you do this, you will notice extra icons and an Edit menu appearing on different parts of the screen. You will also notice the option to Add an activity or resource at the top of every section (topic). This is initiated by clicking Add an Activity or resource. See the separate guides on adding different types of content. Activities (discussions, assignments, etc.) have similar options but also have the group icon to the right meaning that groups can be assigned their own version of a particular activity. See Create and use Groups if you want to divide the students for collaborative activities such as discussion forums or wikis. To edit the name of a resource or activity, click the pencil icon that appears to the right of the name. To change the location of a resource, use the Move icon to the left of the name. To change the appearance or behaviour of the resource or activity, select Edit settings. To indent, use Move right. To make a copy, use Duplicate.For example, when setting up multiple versions of an activity, this will allow a repeated use of settings. Assign roles if you are altering the default roles for the activity. For example, you may give students editing rights on a quiz. Use Delete if you no longer require the resource. N.B. There is no undo on a delete action so act cautiously.